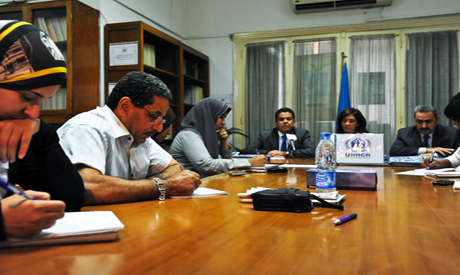 Under the motto “One refugee without hope is too many” the regional office of the United Nations High Commissioner for Refugees (UNHCR) in Egypt held a press conference marking World Refugee Day. The conference was held on Monday 20 June at the United Nations Information Centre in Garden City, Cairo. In its opening statement, standardised across the different UNHCR missions around the world, Ambassador Mohamed Dayri, the UNHCR Regional Representative in Egypt, stressed on the historical role UNHCR has been playing in aiding refugees since the creation of the Geneva Convention in 1951. Violence has been taking its toll on the human race with more than 43 million people displaced across the world. What complicates the situation even further is that more than 80 per cent of this figure is being hosted and cared for by developing countries. Pakistan heads the host countries list, caring for almost two million refugees, mostly coming from neighbouring Afghanistan. In 2010, fewer than 200,000 refugees returned home. This is less than half a percent of the world’s total refugee population. “We need to invest in peace” Ambassador Dayri affirmed. Ambassador Dayri zoomed in on the situation in the Middle East by first thanking the people of Tunisia and Egypt for their indescribable generosity in hosting people fleeing the violence in Libya. According to the Libya Arab Jamahiriya Crisis Situation Report issued on 7 June, 2011 by the United Nations Office for the Coordination of Humanitarian Affairs (OCHA) it is estimated that a total of 328,825 fled the violence in Libya and into Egypt. Only 100,000 of the total figure are Egyptians, while the balance, almost a quarter million, is divided between Libyans and other nationalities. Regarding the efforts exerted for Libyans fleeing the violence Ambassador Dayri, himself a Libyan, wholeheartedly thanked the Egyptian government for retaining its “open door” policy even after 17 Feb when the revolution broke out, allowing Libyans to continue entering Egypt without visa. He also thanked the military establishment for setting up a field hospital in Salloum as well as the Egyptian Red Crescent for the mobile medical centres they have been providing around the same area. On the question of Egyptians still trapped in Libya, Ambassador Dayri commented that, indeed, security is the biggest hurdle; however, other factors, like the lack of fuel, play a role. None of these elements brought the evacuation operation to a complete halt - they just slowed it down. “Since last Wednesday [15 June] more than 800 non-Libyans have been evacuated from Misrata to Benghazi” he commented. Questions were soon asked regarding the recent surge in Syrian refugees seeking shelter in Turkey. “While we run the Shousha Camp on the Tunisian-Libyan border, we don’t have any operation, yet, on the Turkish-Syrian one. For the time being, the Turkish Crescent and the Turkish government are fully in charge of handling the refugees” Ambassador Dayri commented. Moving on to Yemen, the grass doesn’t look any greener. One of the region’s poorest nation, Yemen had already a fair deal of refugees and internally displaced people (IDPs) fleeing lawless Somalia and the internal conflict in the Saada governorate. Adding insult to injury, the situation has been getting worse in the past couple of weeks, with the recent incidents in Zinjibar (capital of Abyan governorate), Aden, and even the country’s capital, Sanaa. Just before concluding the conference, Sudan’s situation was brought up. Ambassador Dayri affirmed that the freeze on resettling Sudanese refugees in other countries is still in effect. This freeze was imposed during the second half of 2004, soon after the Sudanese government and the southern-based Sudan People’s Liberation Movement (SPLM) signed protocols in Naivasha, Kenya, bringing some peace to the civil-war-savaged nation. With 7 July (South Sudan’s official secession day) looming in the horizon, the upcoming days will certainly tell whether violence, already flared in South Kordofan, will escalate or if the situation will regain stability. Without a doubt, 2011, so far, has been a very eventful year in the Middle East. A number of revolutions broke out, with some making it to safely to shore, while others are being met by sheer violence. Regardless, the time has certainly come for all the region’s nations to come together for “collaborated efforts” at the very least on the humanitarian level.